I opened the cover of this tome with eager anticipation—to read and view another of Caniff’s boffo comic-strip stories about the rousing adventures of the heroic Lieutenant Colonel Steven B. Canyon, USAF. Alas! I was disappointed. I found that Caniff’s stories in this volume had plots that are incongruous to the Steve Canyon mystic, and unfortunately, some are nonsensical. Included are several of out-of-character stories: three smarmy, soap opera narratives. One smacks of the travails of Pearl White in Perils of Pauline film serials of 1914–Steve “Do Good” Canyon rescues the damsel in distress from a fate worse than death. Another is a Y/A recital in which Canyon adopts a distant cousin—a sixteen-year old rambunctious and comely female who helps Canyon save his Air Force base from a hostile populous. I missed the roaring adventures of Canyon in some exotic location out whiting the classic “bad guy” that usually has distorted facial or body features. I missed Steve matching wits with a glamorous dame clad in a skin-tight ensemble that reveals more than it ought, and who is intent on corrupting him into her evil designs. I longed to see Caniff’s eeevil Dragon Lady maneuver her voluptuous charms to inveigle Canyon into her piratical schemes and into her quarters on her sea-going junk sailing the South China Seas. Canyon drafts his females out of a dream—gorgeous creatures with body proportions not seen on humans—all proffer a wasp-thin waist, high-arched eyebrows, and brassy bosoms in blouses that are cut on the bias that emphasize their near-perfect form.. I miss Caniff’s finely detailed drawings of yesteryear where most every frame was a cameo —“Terry and the Pirates” of the 30s and “Miss Lace” of the 40s, for examples. 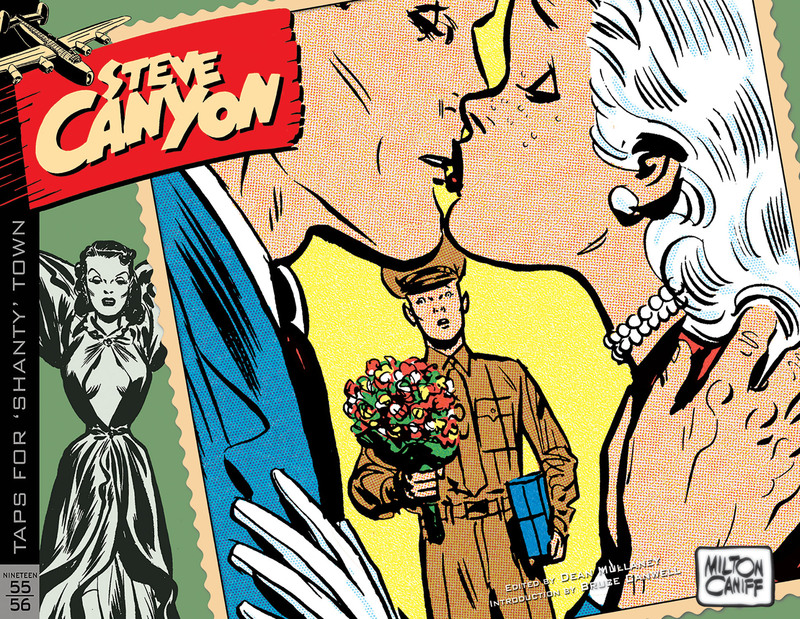 However, progressively in the Steve Canyon narratives, his drawings reflect a short cut to his art. Occasionally some of his drawings mimic his past exactness but far too many do not. Nonetheless all the above, I’m looking forward to getting the next publication in this series.